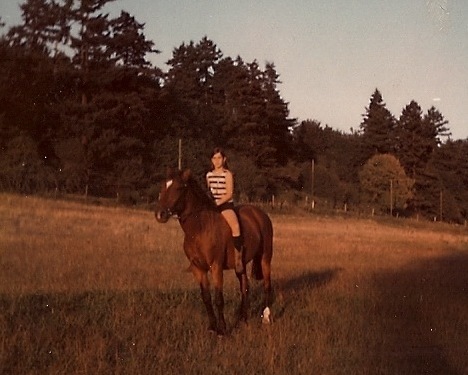 After recently hearing from my dear neighbor that she and many others were under the impression that I began riding as an adult, I made time during the holidays to sit with my mother and go through family photos of my childhood on horseback. Together we found a small selection of shots which triggered some of the happiest days in my life. As my mother says, there are fewer photos of me because I was the last of three children and, back then, it was all about the first-born! As mom and I collected a few photographs, I began the interview process. At 81, what does she remember? We both agreed that one day my father, an Iowa farm boy, simply said “It’s time.” I was eight years old and I had proven to my parents that this love of horses was just not going to go away. I was to spend the weekend with my dad, searching to purchase my first horse! I clearly remember reading the daily newspaper “horses for sale” ads. I clipped a number of them that captured my attention while my father dialed the phone and set up appointments. He had conversation after conversation and, with every phone call, my excitement and anticipation grew about this special creature about to enter my life. Finally, after completing our list of prospects, we loaded up the car and, with directions in hand, were off on a journey that I had dreamed of and only hoped would someday come true. We were on the road for what felt like days, searching for the farms and roadsigns. How did we do it without a cell phone?! By the end of the day, dad had committed to a four year old quarter horse cross. “Suzie Macaroni” was not only overweight from a rich pasture, but had burrs packed in her mane and tail. Her feet were in desperate need of trimming and, to top it all off, she had never been sat on! But my father saw something special in her and led me to believe that, with some hard work, she would be the most beautiful creature on earth. Oh, and beside that, she was the only horse we could afford. Now, either he was crazy or did believe that I could stay on her even if she preferred me on the ground. Our time and training together was a result of perfect trust and the beginning of many days of galloping and learning the details and responsibility of caring for another living creature. Thank you, Suzie, for the life lessons. I am putting them to good use. Pictured: Suzie and Deborah heading to the pond for a summer swim, 1967.